Who God is to us is one of the most important things about us, because it reveals the transformation that the Lord has done in our lives and our understanding of who He is. There is one major important step however that needs to come before we can clearly see who God is and subsequently what we think of Him. Categories: Favorites, Idenity, musings, seeking God, truth | Tags: Growth, Identity, Musings, Truth, Yada | Permalink. I wanted a big miracle at Christmas, you know like the ones in movies. The magical, nostalgic all your dreams come true moments. It’s Christmas Eve and my dreams seem to be running away from me rather then coming closer to fruition. 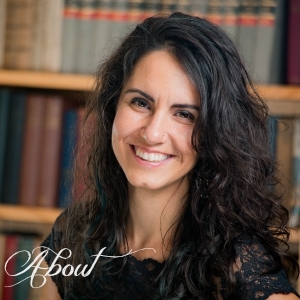 Were the magical moments of childhood just that – a child’s perspective? The older I get the harsher the realities of life and dreams seem. No, I will not be depressed – it IS Christmas! In two hours I would home and the last thing I wanted to do was paste on a fake smile for the kids. They still believed in the magic, and I didn’t want to spoil it for them. They will grow up all to soon. Desperate to not fall into the “black hole” I fiddled with my iPod trying to get some worship music playing. I need a different focus. Desperately. As the miles rolled by I couldn’t help but notice how beautiful the snow looked covering the dead brownness of the countryside. It was beautiful. I couldn’t deny that, no matter how surly my mood. Maybe there is still a little magic left? Trees bowed low under ice and snow crystals that shown even brighter because of the grey sky. Dead and broken weeds and branches now created enticing tunnels into the unknown. 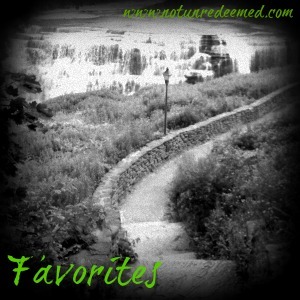 Categories: Favorites, Grace, musings, seeking God, truth | Permalink. I don’t want my dreams to wait. I want them to come now, today! It’s a very uncomfortable realization for me that I might not be ready for my dreams. That I’m still perfecting, still growing. What it comes down to is pride; I want to be ready, I want my dreams now, but it is my perfectionism and desire to be needed and for attention that drives me. Not love for the Lord or His glory. We wait for what we love. (Jacob loved Rachel so much that the 7 years he waited for her seemed but a few days). Categories: Favorites, Grace, Uncategorized | Permalink. Meekness is strength under control. Bam. That’s a definition that had all of us scrambling for our notes. We studied meekness in community group tonight –“Blessed are the meek for they shall inherit the earth”. Jesus was meek and yet He threw out the money changers in the temple. Meek is not what we often think it is. Meek – is not weak! I believe meekness has more to do with our identity than anything else. ‘Meekness denotes a gentle and humble attitude towards others which is determined by a true estimate of ourselves.’ Anyone can be strong, but meekness requires more strength because it means leaving the rights to yourself behind. Jesus was meek because He was under the authority of the Father. He was strength under control. That is why He could be angry and not sin – be angry and still be meek. Jesus had every right to stand up for Himself; He would have been justified in doing so – he was without blame. Yet Jesus was able to be meek – he embodied power and strength under control – because, ‘He entrusted Himself to the one who judges justly.’ His identity was not wrapped up in His self. It wasn’t about Him – It was about the Father who sent Him, and doing the will of the Father. We are to live righteously – we can only do this by doing the same thing as our Lord. Entrusting ourselves to the one who justifies justly. (Justly – with all fairness). Can you trust the Lord to see that you are right? Let Him be the one who justifies you? It means laying down your need for approval from anyone but the Lord. Meekness does not mean that you are a doormat – meekness means that you trust in something greater than yourself. Meekness at it’s core is understanding who you are in Christ and living under His authority – not your own. Righteousness is so much more than being right. Meekness is the most secret of strengths. It is strength of the heart. 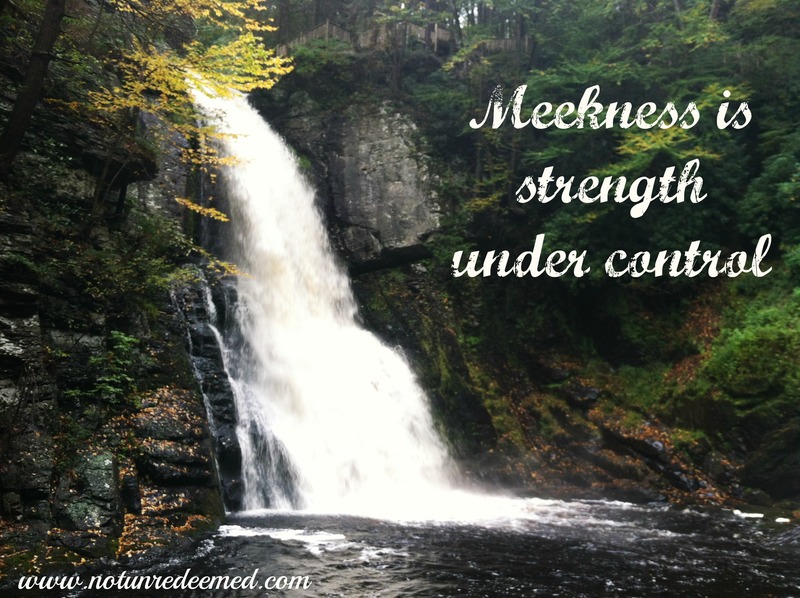 Today’s Tidbit of Truth: Meekness is strength under control. 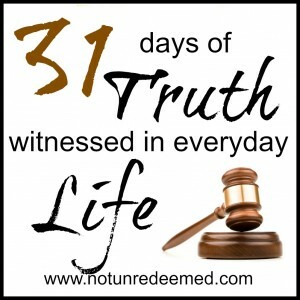 Categories: 31 Days of Truth, Favorites, Idenity | Tags: 31 Days of Truth, Identity | Permalink. And will you try to pull me from the fray? Will you hold me firmly anyway? Have you ever fought with the Lord? Like a mental all around knock down drag out? Here’s a secret – He always wins! And for that I am thankful beyond words that He does not leave me in my sin and pride. Saturday was the day of a big race, one that I had tried to run last year, but my first bout of MRSA prevented me from running just days before the race. This year despite 4 more rounds of MRSA and a weak body I was determined to run. I enjoy running and it’s a time where it’s just me and the Lord and the wind. Over the summer I started training for race again. Victory was going to taste even sweeter this year. When round’s 3 & 4 of MRSA attacked my body again this fall, I was devastated as I once again missed out on crucial weeks of training. But for everyday I could run I was oh so thankful! I didn’t take any day for granted anymore. And I learned there were no good days, there were no bad days, and there are only days of grace. As the race drew near I came to the very painful conclusion that I would not have the stamina to run this race. To much time had been lost! My prideful perfectionism took another blow. A friend suggested wogging it (walk/jogging). I wasn’t thrilled at the idea, but it would kill my perfectionism so that became the new game plan. Staring at the ceiling Friday night, silent tears streaked down my face – why oh why couldn’t I sleep? I wasn’t even going to have the strength to walk the race tomorrow. And that is where the fight began. The Lord started pointing out that I was trying to kill my perfectionism and pride by walking. It doesn’t work that way. When we tell the Lord how and when to humble us it still puts us in control and full of the worse kind of pride – false humility, because we think we are being humble. But oh how I wanted to be in this race! I fought Him stubbornly for a while, coming up with every justification and excuse I could, trying to drowned out His voice. Thanks to my smart phone, I decided a 4:00am browse of Facebook might make Him go away. I didn’t want to rest, to drop out of the race and be humbled. We’re to run in such a way as to win the prize. And that means testifying of His grace. It’s a race. But the race is not always to the swift. Tears once again began to flow as I read. I could no longer ignore Him. The prize is testifying to His grace, and we win by slowing down enough to realize it. For me that meant slowing down to a stop, not being in the foot race at all. As I raised my heart in surrender, grace flowed unearthing and uprooting the real issues in my heart. Forgive me of my pride Lord! I will not run. I will rest, I will accept this illness as being allowed from your hand. The acceptance Elliot speaks of – the distilling act of faith. Lord I can only accept by your grace, not by a choice of my will. Please help me. I wanted to run because I was fighting that this sickness would become part of my identity. But what if you have willed it to? So that your grace can also become part if who I am? – Journal excerpt. Identity. My biggest fear is that this sickness will become a part of who I am. I hate that it changes and affects the way I live my life. I fight against that with every part of my being. Peace only comes when I accept. Not resign myself to it, but accept it as from His hand – there is a huge difference. Resignation is giving up. Acceptance is trust. Knowing God has allowed this and that He sees, knows and understands the pain it brings me – and that through it all He is good. And He is loving and He is faithful. Oh so faithful! To keep this sinner up all night, to not give up on me, but to wrestle with me until I rest in Him. He is not satisfied to allow me second best, but pushes me until I accept His grace. 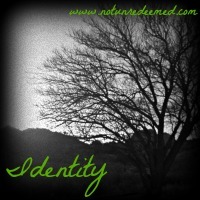 He does not want my identity to be one of sickness, but one of grace. One that reflects His glory. And so this weekend, I ran, I just ran in a very different kind of race. 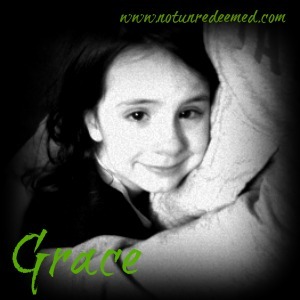 Today’s Tidbit of Truth: The Lord wants grace to be apart of our identity. “How do you want to be led? I hear girls saying all the time that they want guys to lead them, but what does that really look like?” As I looked up at him, compassion and conviction flooded my heart as I caught a small glimpse at the confusion in his. Its true, Christian girls (myself included) are always saying that we want a guy who is able to lead us. But what do we mean when we say that? I stumbled out some type of vague answer; one that I’m sure was not helpful at all, I know it left me with more questions than answers. “How do I want to be lead? What does that look like not just in theory, but in every day life?” And most importantly, “Am I in a place (willing and ready) to be led?” I can’t ask a guy to step up in his God given masculine role, without first being willing to respond and call out more femininity in myself. Over the course of this past summer, I had three guys whom I look up to and respect ask my opinion on what I thought it would look like for a “guy to lead” in relationships (while only another man could teach and lead that by example, as a woman I can give you an opinion and tell you what that would look like for me). And so my dear brothers in Christ, after a lot of thought and prayer, this blog is dedicated to you. Thank you for your heart to seek the Lord and to honor women. I am privileged to know you and call you friends. Knowing. Know who you are in Christ. You were created in His image. How do you uniquely reflect the Lord? Which of His attributes did He entrust to you? While I can love and appreciate a guy, the most exciting thing is falling in love with Jesus in that guy. The way you reflect the Lord is what makes you different from any other Christian guy. When you know who you are in the Lord and are secure in Him, you won’t be looking to us to fulfill you. 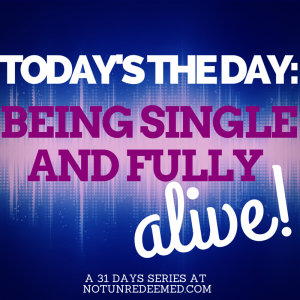 Believe it or not, incredible freedom is found when the pressure is off of you to find a girl who will meet your needs. You are then free to lead us because you are looking upward and forward, not inward. We were created to be your helpmeet. Part of knowing who you are in the Lord, is knowing what the Lord has called you to in life. That knowledge makes it easy to say “Hey Babe, want to join me?” We aren’t going to want to follow where we don’t see at least potential for direction. I’m not saying you have to have it all figured out – we are all works in progress, but be in progress. Seeking, not drifting. Knowing what you were created for, or whose image you were created in, frees us of the confusion surrounding “helpmeet”. Lead me by knowing who you are. And knowing who you are starts with knowing who He is. In the practical sense, leading by knowing, means seeking the Lord first in every area of your life. Any woman worth her salt will gladly take second seat to the Lord. Make Him a priority and you are leading, because He will lead you. While you may not be a husband yet, you are in training! And the good news is, you have friends, sisters and mothers you can practice on. “Live with your wives in an understanding way…” What’s an understanding way? In the Greek “understanding” is translated from a word meaning “know”. 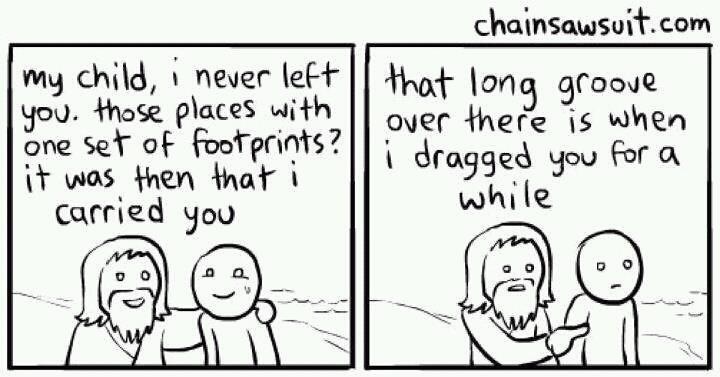 Lead me, by learning me. You cannot lead what you do not know. What are my ups and downs, what makes me tick, gives me life and moves me to tears? How do I like my coffee? Does doing the dishes or simply sitting with me, speak love to me? Every woman is different, I’m sure you’ve realized that by now! And while the basics of love are the same, the practical will be very different. That’s why it’s so important to understand your wife or your girl. Understanding her is leading her, showing her honor as the weaker vessel. Picture a house. The glass in the windows in weaker then the 2×4 studs next to it, but they are what make a house beautiful and full of life. A house without windows would be a dark smelly box. Break a window and it gets boarded up. Not much gets through a boarded window, even prayers. Learn how to polish and care for the glass window. When you lead by learning, you know how to lead because you know what you are leading. You have the intense pleasure of helping us shine the brightest we can be or on the flip side suffocating us. Leading by learning means stewarding the relationships God has given you and cultivating them knowing them and helping them reach their fullest potential. Following. This is perhaps the simplest, hardest and most important point. The most effective way you can lead is to follow. I think one of the most important qualities in a guy “leading me” is a man who has a surrendered heart. I can submit way easier to a man who knows submission himself – because he is submitted to the Lord. 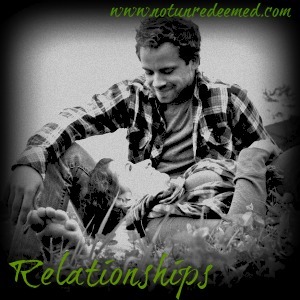 Husbands are supposed to love their wives as Christ loved the church. How does the Lord lead you? Lead me that way! In it’s barest, simplest, form, leading means leading me the way Christ loves and leads you. How does He lead you? Answer that and you will know how to lead any girl. He has given you the master manual in His Word. I could talk a lot more about intentionality, definition, curtsey, humility, and dying to self, but I think you get it. Lead us the way the Lord leads you. Knowing Him is the answer to all of our questions. (1). You say you want to be led. Do you know what that means to you? He can’t meet undefined expectations. (2). We were created to be helpmeets and also imitators of Christ. How does Christ help us? What does He do for us? Today’s tidbit of Truth: Leading is about following. Blog inspired today by conversations with friends and hearing “Lead me” by Sanctus Real. Listen here. This is also the last day to enter to win a copy of the eBook “Pain Redeemed”. Enter here. 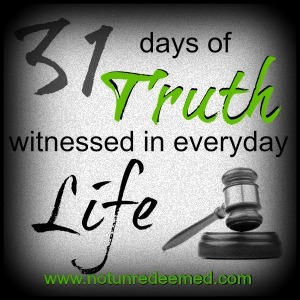 Categories: 31 Days of Truth, Favorites, Q & A, relationships | Tags: 31 Days of Truth, Q & A, Relationships | Permalink. Grasp. Ha, I looked at my email again. Today’s 5 minute Friday prompt is Grasp. I wish I grasped this. Looking down at my legs covered in band aids antiseptic lotion. Discouragement leers at me from every corner. Will I ever gain victory of the virus that delights in the destruction of my body? I cannot grasp an understanding of this. Faithfully following every instruction from multiple doctors, both medical and medicinal, and I still daily fight. SO many days this fall I want to give up and crumble, but I can’t. I serve One who doesn’t give up on fighting with me. For me. I have to grasp this truth. It is the only way to survive – no, to live. You love us way too much to give us lesser things. What if I tried to grasp that? Grasp Who He IS during this time, rather than trying to grasp the ‘why’ of the situation? A nibbling of peace begins to eat at the edges of my weary soul. Whew. 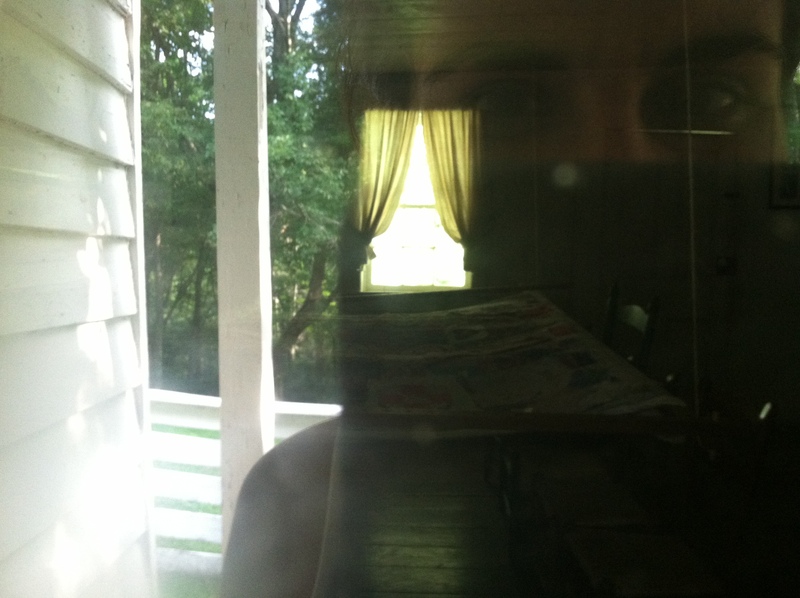 This blog is raw, right from the messy tangles of my heart…. but maybe, just maybe you are feeling raw today too. Grasp – a writing prompt link up from Lisa Jo Baker. Like Not Unredeemed on Face Book! Occasionally I write for KG - Join me? The Lord has used Katie Davis to teach this Katie a lot! Check out her ministry.